I am one step closer to having a quilt. Bella's quilt top was sent off for some fancy schmancy quilting. 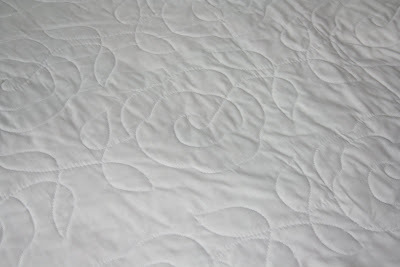 I am very happy with the quilting. I LOVE the roses design, it's pretty and meaningful too. I like how it looks on the backside as well-the white side that is, the backing...you know what I mean. I feel like a bit of a cheat putting it on the bed because it doesn't have a binding yet. I just couldn't wait to see it in Boo's room and I am undecided about the binding. I am not sure whether to go matchy matchy or something contrasting. Bella has requested orange. Hmmm I was thinking a solid teal colour from one of the Heather Bailey prints or maybe the HB 'wallpaper roses' in the darker green. What do you think??? Oh Lea, it's so beautiful!!!!! What did Bella think? I bet she's soooo proud of you. She knew you could do it, even tho you didn't think you could! 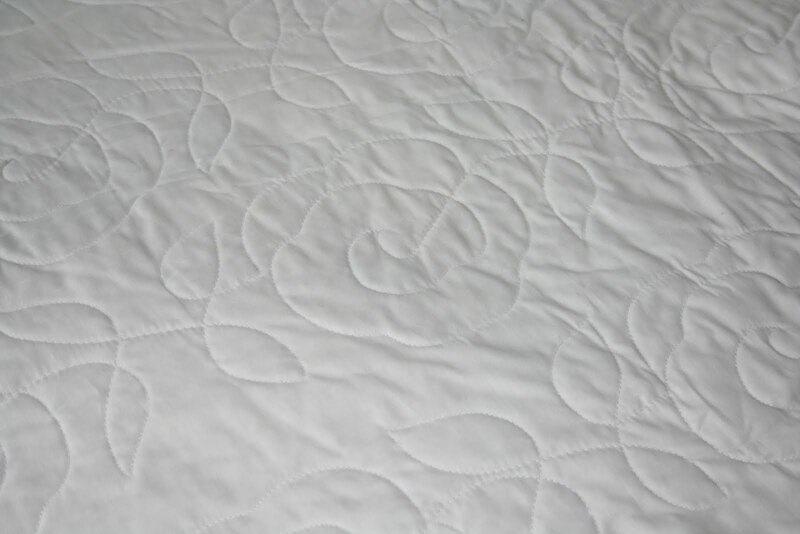 I love the rose quilting too. 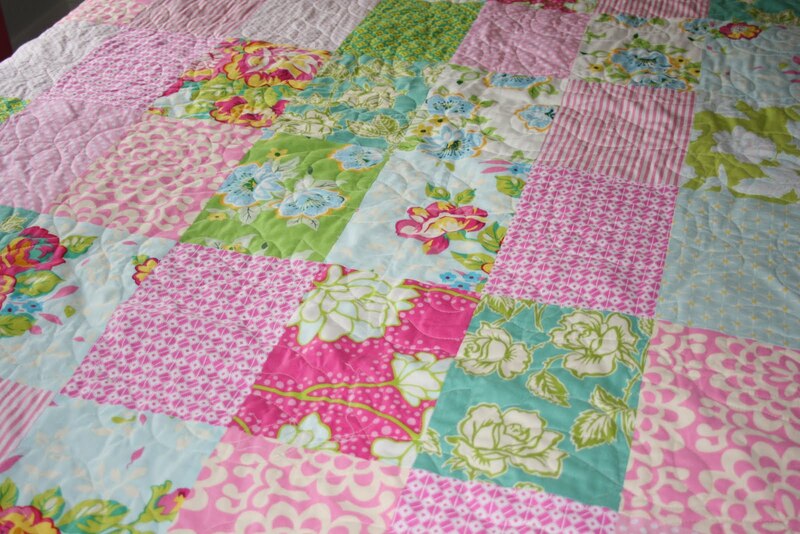 I think the binding would be gorgeous in teal to bring out the little bit of teal in the quilt. Sorry Bella, but I wouldn't go with orange. BUT is IS her quilt! 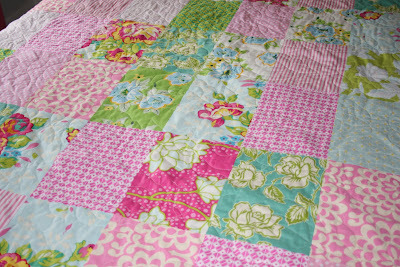 I'm not sorry I went with the green floral Tassy chose for her quilt - it's drowned out by all the nicer fabrics, lol. 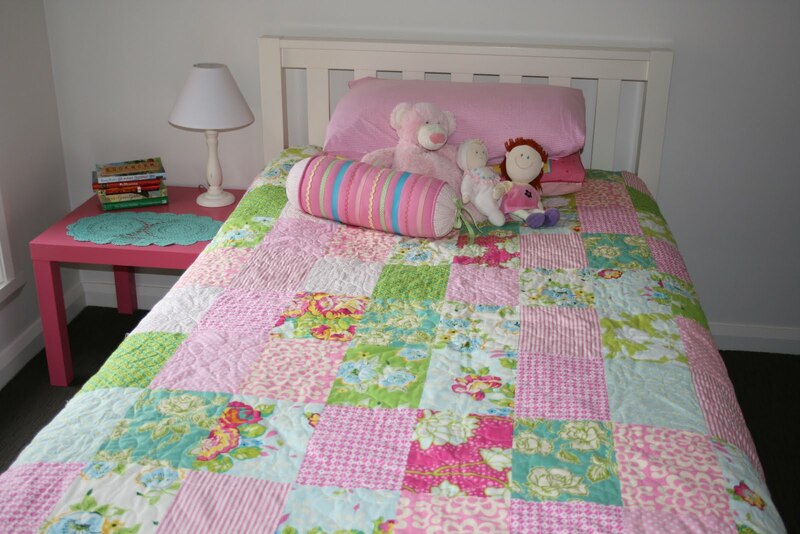 I am so glad you are happy with the quilting. I bet Boo loves it. You are very clever and I'm so proud of you for giving it a go........I'd go the teal...but you already know that. Lea this is absolutely divine. I started making one for Emma but it is still over at the quilt shop. I am so glad that you are blogging again as I couldn't find your other blog when I got my new computer. grr. You are such a clever stitching Mum.... and Bella must love it soooooo much!! Lea is so pretty and beautiful you clever thing! Wow I bet Bella LOVES it!